Entering the CVV2 number helps us to prevent credit card fraud and keep costs down for everyone. All VISA, MasterCard and American Express cards made in America have a CVV2 number. Enter the 4 digit, non-embossed number printed above your account number on the face of your card. Enter the 3-digit, non-embossed number printed on the signature panel on the back of the card immediately following the Visa card account number. Enter the 3-digit, non-embossed number printed on the signature panel on the back of the card. Subscribe Now - Join the Adventure! 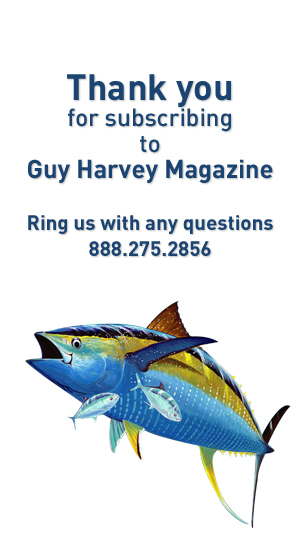 Subscribing to Guy Harvey Magazine is easy. Complete the form below and submit. You’ll find in-depth articles and photography from the world’s top pros including Guy Harvey himself. The editorial focuses on boating, fishing, and diving and the role of ocean conservation in protecting our resources. Also, part of your subscription fee helps to fund the important work of the GH Ocean Foundation and GH Research Institute. Join the Guy Harvey team with your subscription today. are sent via air mail to ensure fast and reliable delivery. As always there is the fine print: Free subscriptions may only be extended to new subscribers with US addresses only and will not be applied to existing Guy Harvey Magazine subscribers. Guy Harvey Magazine reserves the right to discontinue this promotion at any time.